In an era constantly defined by what’s new and next, there’s something to be said for taking a look back. It’s a sentiment shared by the homeowners of this new yet historically inspired Buckhead dwelling. They craved a graceful and understated home that could be enjoyed by several generations. Essentially, the couple was seeking an heirloom, not a trophy. Happy to oblige was residential designer William T. Baker, who drew up a sprawling home with distinct English Regency nuances. “This style tends to be very comfortable and family friendly, which were priorities for the couple. They also wanted it to be timelessly elegant, and this particular style really lends itself to that aesthetic,” he explains. The historical references begin with the striking exterior. Intricate ironwork, painted to match the white brick, greets visitors on the front porch. Through the entryway is a cozy foyer that plays host to plenty of conversations and gatherings thanks to a wood-burning fireplace. “It’s something you very much would have seen in an 18th- or 19th-century English house,” says Baker of the unique space complete with seating arrangements. To complement the warmth cultivated by Baker, the couple returned to interior designer Joy McLean, who had outfitted their previous two homes. A soft palette of creams and beiges, tempered by touches of green, acts as a neutral canvas for not only the stunning garden views visible from each room but also furnishings that hold great importance to the family. “Most of the wood furniture in the home was built over the years by the husband or his father,” says McLean. “It adds such a wonderful sense of familial history. “The couple’s children are now grown, but they’re a very close family and they wanted this home to be a place where they can all gather,” she adds. Taking this into account, McLean’s furniture selections can accommodate a seated dinner for up to 24 people between the dining room and spacious kitchen. Entertaining also often spills out onto the lush backyard, the vision of landscape architect Alec Michaelides and the home’s crowning jewel. It’s impossible to tell that the immaculate English-inspired gardens were only recently planted. “That’s the magic of working with Alec,” says Baker. “He and his team are very adept at creating special spaces. 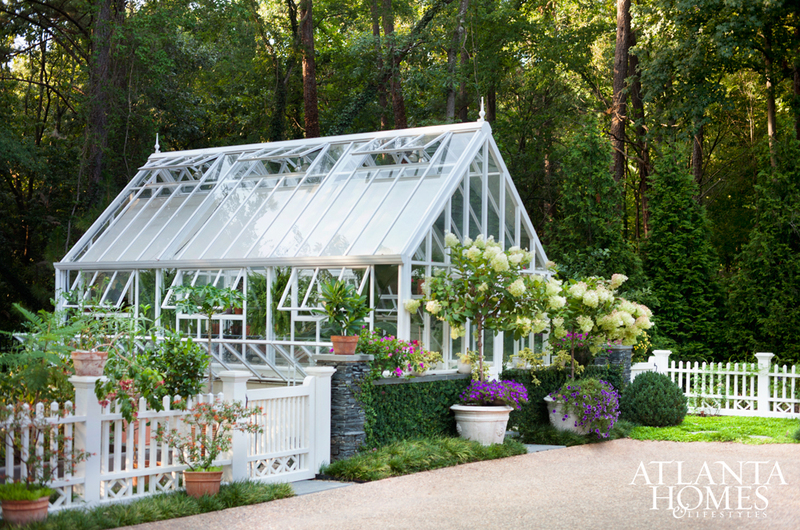 The property looks at least 10 years old.” That includes a charming greenhouse and workshop—both designed by Baker—that are seamlessly woven into the backyard’s verdant landscape.